Fresh off his win in Pro UTV at the last round of the Worcs series Nic Granlund headed to round five of the Dirt Series held at Perris Raceway. As practice approached, Nic was dialing in a new shock set up provided by Fox racing shocks and he was eager to try it out on the track. With a fresh set of STI Rocktane tires and HD wheels Nic went out for practice to learn the track and get the car set up finalized. After practice Nic felt confident with the set up of his Polaris RZR XP 900 and with some final tuning of the Yoshimura engine management system Nic’s engine was running in top shape. Due to the increasing numbers of entries at the Dirt series the 1000cc classes would be be split up into separate races, this change allowed Nic to sign up for the 1000cc production class and the 1000cc unlimited class. Now Nic had a full day of ahead of him that would consist of competing in four heat races or motos. With the help of Got Tools racing’s Mike Geiger, Nic prepped the starting line and strapped himself into his PRP racing seat for moto one of the 1000cc production UTV class. Fresh off his win in Pro UTV at the last round of the Worcs series Nic Granlund headed to round five of the Dirt Series held at Perris Raceway. As practice approached, Nic was dialing in a new shock set up provided by Fox racing shocks and he was eager to try it out on the track. With a fresh set of STI Rocktain tires and HD wheels Nic went out for practice to learn the track and get the car set up finalized. After practice Nic felt confident with the set up of his Polaris RZR XP 900 and with some final tuning of the Yoshimura engine management system Nic’s engine was running in top shape. Due to the increasing numbers of entries at the Dirt series the 1000cc classes would be be split up into separate races, this change allowed Nic to sign up for the 1000cc production class and the 1000cc unlimited class. Now Nic had a full day of ahead of him that would consist of competing in four heat races or motos. With the help of Got Tools racing’s Mike Geiger, Nic prepped the starting line and strapped himself into his PRP racing seat for moto one of the 1000cc production UTV class. As the gate dropped, Nic grabbed a third-place hole shot quickly making some moves & driving into the lead halfway through the first lap. 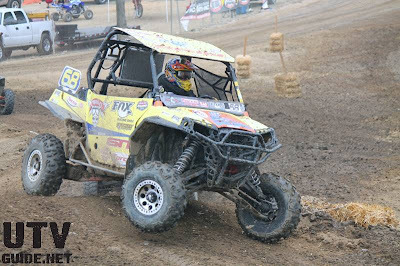 For the entire race it was just a matter of driving smooth and consistent to take the win in moto one of 1000cc Production UTV. Next up was the 1000cc unlimited class. In this race Nic knew he would have some tough competition from the high horseower and bigger engine machines. Again Nic managed a top three start and made his way into the lead to set a comfortable pace and easily take the 1000cc Unlimited UTV moto win! Moto two of the 1000cc production class went pretty much the same as the first race resulting in Nic’s third win of the day & the overall win. When the gate dropped for the final race of the day in the 1000cc unlimited class Nic slotted into second place behind the leader and was pressuring him for the first few laps driving a clean race. While Nic was trying make some moves on the leader, he did not want to make any contact. No contact was needed though as the leader had a mechanical issue handing Nic the lead. As the race continued Nic would encounter lapped traffic which would allow some other competitors to catch up. 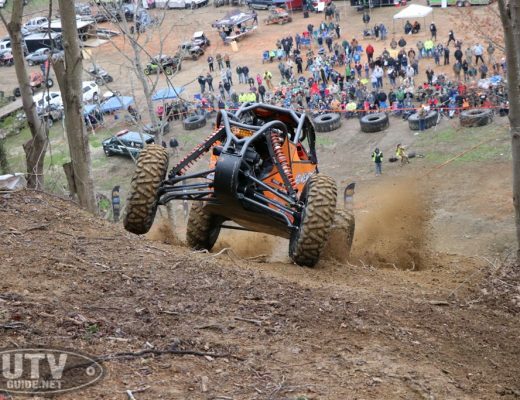 With five UTVs scrambling for the same position of the track there was some confusion and some drivers missed an obstacle on the course which allowed them to take the lead. Although Nic crossed the finish line in second, after video review confirming the incident of the missed obstacle, Nic was awarded the moto win and the overall for Round 5 of The Dirt Series. Nic had a flawless day by winning the overall in both the 1000cc Production class and the 1000cc Unlimited class and all four Moto’s he entered at around five of the Dirt series. Nic is working hard and looking forward to more great results at the next round of the work series in Glen Helen California. As always none of this would be possible without the great support from all of Nic’s sponsors. Fox Racing Shox, STI tire and wheel, Yoshimura Racing, Cognito motorsports, Polaris, Got tools Racing, Torco lubricants, Moto-Active, Nic G Motorsports, PRP seats, Triumph motorsports, Summers Brothers Axles. Nic would also like to thank his family and pit crew for all of their help and support.